Sound and audio features e.g. speaker(s), audio jack, vibration motor, etc. Prior to its official announcement, media outlets reported on rumors and information from industry insiders. In December 2016, SamMobile reported that the Galaxy S8 would not feature a 3.5 mm headphone jack, later reported to be a false rumor. In January 2017, The Guardian reported on bigger screens for both of the two phone sizes, with edge-to-edge "infinity" displays and very limited bezels, and an iris scanner. Additionally, The Guardian stated that the phones would come with 64 gigabytes of storage and support microSD cards, use USB-C connectors, and feature a "Bixby" intelligent personal assistant. Soon after, VentureBeat revealed photos of the phones and additional details, including the lack of physical navigation and home buttons, in which the fingerprint sensor was moved to the back of the phone. Evan Blass tweeted in mid-March about color options for the phones. The Galaxy S8 and S8+ were officially unveiled on 29 March 2017, with pre-orders beginning 30 March and official U.S. release on 21 April 2017. Following Best Buy retail listings in March, Samsung opened pre-orders for unlocked U.S. handsets on 9 May 2017, with availability starting 31 May. The devices have also been released internationally. On 21 April 2017, they were made available in South Korea, Canada, and Taiwan. On 28 April, they were made available in the United Kingdom, Australia, Ireland, and Russia. followed by Singapore one day later. On 5 May, they were made available in Malaysia. New Zealand, India, the Philippines, and Thailand. followed by Brazil on 12 May. On 25 May, they were made available in China, and Hong Kong. On 8 June, they were made available in Japan. In July 2017, pictures of the Galaxy S8 Active were leaked on Reddit, and the following month, AT&T "accidentally" confirmed its existence through a document in a promotional campaign. It officially became available for pre-order, exclusively through AT&T, on 8 August 2017, with in-store purchase available 11 August. VentureBeat reported in late September that the device would also become available through T-Mobile in November, and Samsung subsequently confirmed both T-Mobile and Sprint availability in early November. 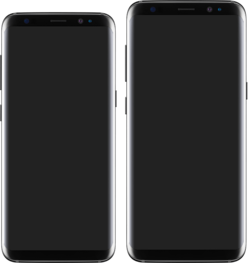 The Galaxy S8 and S8+ both feature 1440p OLED displays, with an 18.5:9 (37:18) aspect ratio taller than the 16:9 ratio used by the majority of smartphones; the S8 has a 5.8-inch panel, while the S8+ uses a larger 6.2-inch panel. The displays on both devices curve along the side bezels of the device, with minimal bezels that Samsung markets as an "infinity display", and the display panel itself has rounded edges. They use DCI-P3, offering what screen-testing website DisplayMate describes as the largest native color gamut, highest peak brightness, highest contrast rating in ambient light, highest screen resolution, lowest reflectance, and highest contrast ratio. The S8 features an octa-core Exynos 8895 system-on-chip and 4 GB of RAM; models in North American and East Asian markets utilize the Qualcomm Snapdragon 835 instead. Both chips are manufactured by Samsung with a 10 nm process. They contain 64 GB of internal storage, expandable via microSD card. The Galaxy S8 is one of the first smartphones to support Bluetooth 5, supporting new capabilities such as connecting two wireless headphones to the device at once. It is also bundled with Harman AKG earbuds. Both smartphones have improved satellite navigation over the predecessors by including Galileo receivers. In the United States, the S8 and S8+ are available in Midnight Black, Orchid Gray, and Arctic Silver color options, whereas gold and blue are available internationally. The blue option was made available in the U.S. in July 2017. Unlike past Galaxy S series models, the S8 line does not feature physical navigation keys, electing to use on-screen keys instead. However, unlike other implementations, the home button can still be activated if it is hidden or the screen is off. The S8's display features pressure sensitivity limited to the home button. To prevent the home button from burn-in damage, its position moves slightly. While The Verge claims that the S8 uses exactly the same 12-megapixel rear camera as the S7, though with software improvements, a report from PhoneArena claims that the phones carry new, custom camera modules. The front-facing camera was upgraded to an 8-megapixel sensor with autofocus. The S8 features fingerprint and iris scanners; the fingerprint reader is relocated to the rear of the device, to the left of the camera, due to the removal of the physical home button. In addition to an iris scanner, the S8 also features face-scanning as an option to unlock the phone. Face recognition technology had previously been implemented in earlier models since the Galaxy S III. The S8 and S8+ use non-removable 3000 and 3500 mAh batteries respectively; Samsung stated that it had engineered the batteries to retain their capacity for a longer period of time than previous models. The S8 supports AirFuel Inductive (formerly PMA) and Qi wireless charging standards. Due to the recalls of the Samsung Galaxy Note 7, Samsung said in a press conference it is committed to stricter quality control and safety testing procedures on all of the company's future products. Samsung also launched a Galaxy S8+ with 128 GB of storage and 6 GB of RAM exclusively in China and South Korea, and a bundle offer in the countries provides both the exclusive model and the Samsung DeX docking station. The unique variant was also released in India in June 2017. The Galaxy S8 Active features a rugged design and significantly tougher materials to make it shock, shatter, water, and dust resistant. It has a larger battery than either of the regular S8s, at 4000 mAh. Unlike the previous phones in the Active line, the S8 Active does not have tactile buttons, instead using onscreen keys like the regular variants of the S8. It also no longer has the dedicated action button of previous versions which could be reprogrammed to be a shortcut to favorite apps, with the action button being replaced with the Bixby button. The "infinity" edge display of the standard models is removed, replaced with a metal frame and bumpers in the corners to protect from shocks, while the back is fitted with a "rugged, tough texture for a secure grip". Its screen also measures 5.8 inches, the size of the regular S8, and has quad HD Super AMOLED in 18.5:9 aspect ratio. The S8 Active is sold in Meteor Gray, but AT&T also has a Titanium Gold color. The T-Mobile US version of the S8 Active also supports the company's 600 MHz LTE network that was starting to be rolled out at the time the device was announced. The Galaxy S8 launched with the Android 7.0 "Nougat" operating system with the proprietary Samsung Experience (formerly TouchWiz) user interface and software suite. The software features a suite of assistant functions known as "Bixby", which is designed primarily to interact with Samsung's bundled applications and other supported services. The feature allows the use of voice commands to perform phone functions, can generate cards shown on a home screen page (replacing the Flipboard integration formerly featured) based on a user's interactions, and perform searches utilizing object recognition via the camera. Bixby supports third-party integration via an SDK. The S8 supports the use of a docking station known as Samsung DeX to access a PC-like desktop environment on an external display, with support for mouse and keyboard input. On 21 April 2017, coinciding with the phone's official retail date, reports surfaced that the default music player on the Galaxy S8 would be Google Play Music, continuing a trend that started with the S7 in 2016. However, for the S8, Samsung partnered with Google to incorporate additional exclusive features into the app, including the ability to upload up to 100,000 tracks to the service's cloud storage, an increase from the 50,000 tracks users are normally allowed to upload. Additionally, new users get a three-month free trial to the service, the same as given to users who purchase Google's own Pixel smartphone. Furthermore, Google stated that more Samsung-exclusive features will be added to the app in the future, and that the Bixby assistant will also be supported by the app. Bixby replaces S Voice, the voice recognition technology previously found in Samsung Galaxy models. In May 2017, Google announced that the Galaxy S8 and S8+ will support the company's Daydream virtual reality platform after Samsung rolls out a software update scheduled for mid-2017. In July 2017, Verizon began rolling out an update for its devices, with support for Daydream. The Galaxy S8 was one of the first Android phones to support ARCore, Google's augmented reality engine. In February 2018, the official Android 8.0.0 "Oreo" update began rolling out to the Samsung Galaxy S8, Samsung Galaxy S8+, and Samsung Galaxy S8 Active. In February 2019, Samsung released the official Android 9.0 "Pie" for the Galaxy S8 family. Besides the phone's protective case reportedly cracking and peeling away in under 2 months of use, Dan Seifert of The Verge praised the design of the Galaxy S8, describing it as a "stunning device to look at and hold" that was "refined and polished to a literal shine", and adding that it "truly doesn't look like any other phone you might have used before". The hardware of the device was described as "practically flawless". Seifert also liked the new software, writing that "Samsung is known less for polish and more for clumsiness. In a refreshing change of pace, the software on the S8 is, dare I say, good [sic]". However, he criticized the Bixby assistant, writing that "in its current state, it doesn’t do much at all", and also criticized the number of duplicate apps. Regarding performance, he wrote that the S8 was "fast and responsive, but so is virtually every other premium phone you can buy, and the S8 isn’t noticeably faster or quicker than a Google Pixel, LG G6, or iPhone 7". Fellow Verge reporter Vlad Savov felt that the placement of the fingerprint sensor was "a perplexing decision if we consider it as a deliberate design choice", but noted reports from Korea claiming that Samsung had originally intended for the fingerprint reader to be built directly into the screen, but was unable to reach a desirable implementation in time for release. The Verge wrote that "Samsung’s six-month-old S8 has cutting edge features and design with fewer issues than other Android phones" like the Google Pixel 2 and LG V30, and that the "OLED screen stretches to the edges of the device and curves on its sides in an almost liquid fashion. It makes the S8 look just as fresh today as it did when it debuted", and pointing out that the S8's popularity and carrier support guaranteed plenty of third-party accessories. Chris Velazco of Engadget similarly praised the design, stating that "from their rounded edges to their precisely formed metal-and-glass bodies, they feel like smaller, sleeker versions of the Galaxy Note 7", and also praised the display as being simply "awesome". Velazco also praised the software, calling Samsung's added interface "subtle and thoughtful in its design choices". While noting that the Bixby assistant wasn't ready yet, he did compliment the promised voice features as being more granular than those offered through Siri or Google Assistant, and wrote that "With that kind of complexity involved, maybe it's no surprise this stuff isn't done yet". Also praising performance and the camera, though noting that "The 12-megapixel sensors on the back haven't changed much since last year. That's not a bad thing since they were great cameras to start with", Velazco summarized his review by writing that the devices "aren't perfect, but they're as close as Samsung has ever gotten". Brandon Russell of TechnoBuffalo claimed that the camera could not beat Google's Pixel smartphone. Ron Amadeo of Ars Technica noted that the device's unusual aspect ratio resulted in pillarboxing when watching 16:9 video without zooming or stretching it. He complimented the feel of the S8, calling it "perfected", but criticized the glass back for being "more fragile" and that "Glossy, slippery glass doesn't feel as good in your hand as metal does, either. For the top-tier premium price tag, we'd prefer Samsung to put in the extra work and use a metal back". He criticized the biometric options for unlocking the phones, writing that "There's an iris scanner, a fingerprint reader, and face unlock. The problem is none of them are any good", and also criticized duplicate apps, writing that "most of which can't be removed and aren't very compelling". Additionally, he criticized Bixby, calling it "an odd addition" due to the phone's Google Assistant functionality already present. Prior to the phone's official announcement, reports suggested that Bixby would support "7-8 languages" at launch. Later reports after the phone's announcement clarified that Bixby would only support Korean and American English languages at its release, though noting that more languages would be coming "in the following months". In mid-April, The Wall Street Journal reported that Bixby would be launched without support for American English. On 19 July 2017, Samsung announced that Bixby had begun rolling out to Galaxy S8 users in the United States. The Samsung Galaxy S8 and Galaxy S8+ broke pre-order records in South Korea, with more than 720,000 units booked in one week, a notable increase from the 100,000 units of the Galaxy S7 and 200,000 units of the Note 7. By mid-April, the number had increased to one million pre-orders. On 24 April 2017, Samsung announced that sales of the Galaxy S8 was its "best ever". Although it did not release specific sales numbers, it announced that sales of the S8 were 30% higher year-over-year than the Galaxy S7. Subsequent reports in May announced that Samsung had sold over five million units. Jon Fingas of Engadget wrote that, although Samsung advertised its pre-order records, sales comparisons to other models on the market were difficult due to unannounced sales figures. Prior to the official release, it was reported that some Galaxy S8 displays had a bad white balance, causing them to exhibit a reddish tint. Samsung stated that the Galaxy S8 was "built with an adaptive display that optimizes the colour range, saturation, and sharpness depending on the environment", but noted that the device's operating system provides settings for manually adjusting the display's appearance and white balance. On 21 April, Samsung stated that the red tinting was purely a software issue, and would be patched in a future update. The Investor reported that Samsung would replace the affected devices if a software update did not fix the issue. Updates in various regions started rolling out in early May, fixing the issue. Reports surfaced at the end of April 2017 that some Galaxy S8 devices were "restarting by themselves". Samsung has not yet commented on the issue. Shortly after the phone's unveiling, bloggers produced a video showing that the Galaxy S8's facial recognition scanner could be tricked to unlock the phone by showing it a photo of the user. In a statement to Business Insider, a Samsung spokesperson stated that "Facial recognition is a convenient action to open your phone – similar to the 'swipe to unlock' action. We offer the highest level of biometric authentication – fingerprint and iris – to lock your phone and authenticate access to Samsung Pay or Secure Folder". In May 2017, researchers from the Chaos Computer Club posted a video showing that the S8's iris recognition system can be fooled with a contact lens and a suitable photograph of an eye. Samsung told BBC News that it was "aware of the issue", and stated that "If there is a potential vulnerability or the advent of a new method that challenges our efforts to ensure security at any time, we will respond as quickly as possible to resolve the issue". In October 2017, Galaxy S8 users reported on Reddit that they were unable to receive SMS messages, with no fix available and without any comment from Samsung. ^ a b Abhijeet. "BREAKING: Stable Galaxy S8 Android Pie update released in Germany". SamMobile. Retrieved 20 February 2019. ^ Smith, Chris (24 May 2017). "The Galaxy S8 may be a huge hit, but Samsung is already working on the next big thing". BGR. Penske Media Corporation. Retrieved 18 July 2017. ^ Buckley, Sean (29 March 2017). "Samsung's 'unbox your phone' event gave us a phone that's still a box". Engadget. AOL. Retrieved 19 July 2017. ^ a b "Samsung Galaxy S8 Specifications". Samsung. Retrieved 30 March 2017. ^ Smith, Chris (29 March 2017). "Galaxy S8 and Galaxy S8+: The full specs". BGR. Penske Media Corporation. Retrieved 5 December 2017. ^ "Samsung Exynos 8895 Octa". NotebookCheck. Retrieved 5 December 2017. ^ "Qualcomm Snapdragon 835 (8998)". NotebookCheck. Retrieved 5 December 2017. ^ D., Luis (8 May 2017). "Lots of Snapdragon 835 Galaxy S8 units apparently have UFS 2.0 instead of newer UFS 2.1 memory. Should you care?". PhoneArena. Retrieved 13 May 2017. ^ G, Mark. "Specifications - Samsung Galaxy S8 and S8+". Samsung. Retrieved 2 April 2019. ^ F., Adnan (6 December 2016). "Exclusive: Galaxy S8 is not going to feature a 3.5mm headphone jack". SamMobile. Retrieved 4 April 2017. ^ Ruddock, David (13 January 2017). "Rumor: The Galaxy S8 will have a headphone jack after all". Android Police. Retrieved 5 April 2017. ^ a b Gibbs, Samuel (24 January 2017). "Samsung Galaxy S8 to have bigger 'infinity' display, insiders say". The Guardian. Guardian Media Group. Retrieved 5 April 2017. ^ Siegal, Jacob (24 January 2017). "In-depth Galaxy S8 report details new 'infinity display' and more". BGR. Penske Media Corporation. Retrieved 5 April 2017. ^ Villas-Boas, Antonio (24 January 2017). "A new leak just revealed pretty much everything about Samsung's next big smartphone, the Galaxy S8". Business Insider. Axel Springer SE. Retrieved 5 April 2017. ^ Blass, Evan (26 January 2017). "This is the Samsung Galaxy S8, launching March 29". VentureBeat. Retrieved 5 April 2017. ^ Welch, Chris (26 January 2017). "This is the first image of the Samsung Galaxy S8". The Verge. Vox Media. Retrieved 5 April 2017. ^ Amadeo, Ron (26 January 2017). "Galaxy S8 gets pictured: No home button, huge 5.8- and 6.2-inch displays". Ars Technica. Condé Nast. Retrieved 5 April 2017. ^ Dunn, Jeff (19 March 2017). "The latest Samsung Galaxy S8 leak claims to show different color options for the upcoming phones". Business Insider. Axel Springer SE. Retrieved 5 April 2017. ^ Heisler, Yoni (20 March 2017). "Leaked Galaxy S8 photos show range of new color options". BGR. Penske Media Corporation. Retrieved 5 April 2017. ^ a b c d e f g h i j k Bohn, Dieter (29 March 2017). "This is the Samsung Galaxy S8, coming April 21st". The Verge. Vox Media. Retrieved 30 March 2017. ^ Velazco, Chris (29 March 2017). "The Galaxy S8 and S8+ pack big changes into gorgeous bodies". Engadget. AOL. Retrieved 5 April 2017. ^ Welch, Chris (29 March 2017). "Samsung's Galaxy S8 and S8 Plus will be available unlocked from Best Buy in May". The Verge. Vox Media. Retrieved 9 May 2017. ^ Statt, Nick (9 May 2017). "Samsung opens US preorders for unlocked Galaxy S8 and S8 Plus". The Verge. Vox Media. Retrieved 9 May 2017. ^ Haselton, Todd (9 May 2017). "Samsung just announced a version of the Galaxy S8 that international travelers should love". CNBC. NBCUniversal News Group. Retrieved 9 May 2017. ^ F., Adnan (23 March 2017). "Galaxy S8 release date for South Korea said to be April 21". SamMobile. Retrieved 5 December 2017. ^ Behar, Rose (29 March 2017). "Samsung Galaxy S8 and S8+ Canadian pricing and availability". MobileSyrup. Retrieved 5 December 2017. ^ Liao, George (30 March 2017). "Samsung introduces flagship Galaxy S8 and S8＋". Taiwan News. Retrieved 5 December 2017. ^ "Samsung Galaxy S8 and S8+: UK price, release date and pre-order information". The Daily Telegraph. Telegraph Media Group. 30 March 2017. Retrieved 21 April 2017. ^ Simpson, Campbell (30 March 2017). "Samsung Galaxy S8: Australian Pricing And Release Date". Gizmodo. Retrieved 5 December 2017. ^ Curtis, Sophie (31 March 2017). "Samsung Galaxy S8: Irish release date, price, specs and features of Samsung's new flagship smartphone". Daily Mirror. Trinity Mirror. Retrieved 5 December 2017. ^ N, Nuzhat (19 April 2017). "Samsung Galaxy S8 and S8+ pre-orders begin in Russia, priced 54,990 and 59,990 rubles". The Android Soul. Retrieved 5 December 2017. ^ Hongzuo, Liu (16 April 2017). "Samsung Galaxy S8 and S8+ available in Singapore from 29 April 2017". Singapore Hardware Zone. Retrieved 5 December 2017. ^ Loi, Elissa (6 April 2017). "This is when the Samsung Galaxy S8 and S8+ will hit Malaysia". Stuff.co.nz. Haymarket Media Group. Retrieved 5 December 2017. ^ Pilcher, Pat (3 April 2017). "Review: Samsung Galaxy S8". Stuff.co.nz. Fairfax New Zealand. Retrieved 5 December 2017. ^ "Samsung Galaxy S8 Launched in India Starting Rs. 57,900, Available From May 5: Highlights". Gadgets360. NDTV. 19 April 2017. Retrieved 5 December 2017. ^ Gonzales, Gelo (11 July 2017). "Samsung Galaxy S8 arrives in PH on May 5". Rappler. Retrieved 5 December 2017. ^ "Samsung confirms release date of Galaxy S8 and S8 Plus in Thailand". ThaiTech. 29 April 2017. Retrieved 5 December 2017. ^ N, Nuzhat (20 April 2017). "Galaxy S8 and S8+ Brazil release set for May 12, priced R$ 3,599 and R$ 3,959". The Android Soul. Retrieved 5 December 2017. ^ Onawole, Habeeb (4 May 2017). "Samsung Galaxy S8 China Release Date and Pricing". Gizmochina. Retrieved 5 December 2017. ^ Sin, Ben (2 May 2017). "Samsung Galaxy S8 full review: at HK$5,698 it's pricey but there's a lot to like, from its feel to its look to its processing power". South China Morning Post. News Corporation. Retrieved 5 December 2017. ^ Koguchi, Takahiro (8 June 2017). "Galaxy S8 / S8+、国内販売が本日開始。ドコモとauが取り扱い". Engadget (in Japanese). Oath Inc. Retrieved 5 December 2017. ^ Duino, Justin (23 July 2017). "Samsung Galaxy S8 Active: Leaked images show replacement of customizable Active key w/ Bixby button". 9to5Google. Retrieved 5 December 2017. ^ Gartenberg, Chaim (24 July 2017). "Samsung's Galaxy S8 Active looks like a more boring S8". The Verge. Vox Media. Retrieved 5 December 2017. ^ Gartenberg, Chaim (3 August 2017). "AT&T accidentally confirmed Samsung's Galaxy S8 Active". The Verge. Vox Media. Retrieved 5 December 2017. ^ Gottsegen, Gordon (3 August 2017). "AT&T 'confirms' Galaxy S8 Active ahead of announcement". CNET. CBS Interactive. Retrieved 5 December 2017. ^ a b Ong, Thuy (7 August 2017). "Samsung's Galaxy S8 Active will be available for preorder tomorrow". The Verge. Vox Media. Retrieved 5 December 2017. ^ Blass, Evan (28 September 2017). "Samsung Galaxy S8 Active escapes AT&T's orbit, headed to T-Mobile". VentureBeat. Retrieved 5 December 2017. ^ Blass, Evan (7 November 2017). "Samsung confirms Galaxy S8 Active's November release on T-Mobile and Sprint". VentureBeat. Retrieved 5 December 2017. ^ Smith, Chris (4 April 2017). "Expert says Galaxy S8 has best phone display ever, and that's great news for the iPhone 8". BGR. Penske Media Corporation. Retrieved 13 May 2017. ^ Hruska, Joel (4 April 2017). "The Samsung Galaxy S8's display is the best you can buy: DisplayMate". ExtremeTech. Ziff Davis. Retrieved 13 May 2017. ^ Simon, Michael (24 January 2017). "Report: Snapdragon 835 will launch first in Galaxy S8, others have to wait". PC World. International Data Group. Retrieved 30 March 2017. ^ O'Kane, Sean (29 March 2017). "The Samsung Galaxy S8 is the first phone with Bluetooth 5.0". The Verge. Vox Media. Retrieved 30 March 2017. ^ Gartenberg, Chaim (29 March 2017). "The Galaxy S8 will come bundled with a pair of $99 wired Harman AKG headphones". The Verge. Vox Media. Retrieved 30 March 2017. ^ Alvarez, Edgar (29 March 2017). "Every Galaxy S8 comes with a pair of $99 AKG earbuds". Engadget. AOL. Retrieved 9 April 2017. ^ Carman, Ashley (19 July 2017). "Samsung's coral blue Galaxy S8 and S8 Plus will be released in the US on July 21st". The Verge. Vox Media. Retrieved 20 July 2017. ^ Gottsegen, Gordon (19 July 2017). "Coral blue Galaxy S8 splashes down July 21, with deals". CNET. CBS Interactive. Retrieved 20 July 2017. ^ Kastrenakes, Jacob (29 March 2017). "Samsung's Galaxy S8 has a pressure-sensitive home button built into the screen". The Verge. Vox Media. Retrieved 30 March 2017. ^ Vincent, James (28 April 2017). "The Galaxy S8's home button moves, and there's a good reason for it". The Verge. Vox Media. Retrieved 28 April 2017. ^ LeFebvre, Rob (28 April 2017). "The Galaxy S8's home button shifts to prevent screen burn". Engadget. AOL. Retrieved 28 April 2017. ^ P., Daniel (31 March 2017). "Galaxy S8 and S8+ come with new Sony IMX333 and Samsung camera sensors". PhoneArena. Retrieved 3 September 2017. ^ a b c d Segan, Sascha (29 March 2017). "Samsung Galaxy S8". PC Magazine. Ziff Davis. Retrieved 30 March 2017. ^ Carman, Ashley (29 March 2017). "The Galaxy S8's face-scanning feature might make you forget about its misplaced fingerprint scanner". The Verge. Vox Media. Retrieved 5 April 2017. ^ Bader, Daniel (3 April 2017). "The Galaxy S8 has face recognition and iris scanning, and you have to choose one". Android Central. Retrieved 5 April 2017. ^ Reynolds, Dylan (4 May 2012). "Samsung unveils Galaxy S III smartphone with face, voice recognition". CNN. Retrieved 7 April 2017. ^ Walter, Derek (2 September 2016). "Everything you need to know about wireless charging". TechHive. International Data Group. Retrieved 30 March 2017. ^ Goode, Lauren (22 January 2017). "This is how Samsung plans to prevent future phones from catching fire". The Verge. Vox Media. Retrieved 30 March 2017. ^ Gartenberg, Chaim (6 April 2017). "Samsung is selling an S8 Plus with 128GB of storage and 6GB of RAM, but only in Asia". The Verge. Vox Media. Retrieved 9 April 2017. ^ Wilhelm, Parker. "There's a Samsung Galaxy S8 with 6GB of RAM – but no you can't have it". TechRadar. Future plc. Retrieved 9 April 2017. ^ "Samsung Galaxy S8+ 6GB RAM, 128GB Storage Variant Goes on Sale in India". Gadgets360. NDTV. 9 June 2017. Retrieved 11 June 2017. ^ "Mighty Fast: The Durable, Speedy Samsung Galaxy S8 Active Busts Into T-Mobile" (Press release). T-Mobile US. 7 November 2017. Retrieved 27 March 2018. ^ Warren, Tom (29 March 2017). "Samsung's Galaxy S8 can turn into a PC with its DeX dock". The Verge. Vox Media. Retrieved 30 March 2017. ^ Welch, Chris (21 April 2017). "Samsung will use Google Play Music as the default music app on its devices". The Verge. Vox Media. Retrieved 21 April 2017. ^ Ingraham, Nathan (21 April 2017). "Galaxy S8 owners can upload 100,000 songs to Google Play Music". Engadget. AOL. Retrieved 21 April 2017. ^ Reigh, Brian. "We need to talk about Samsung's Bixby". Android Authority. Retrieved 27 April 2017. ^ Garun, Natt (17 May 2017). "Samsung Galaxy S8 and S8 Plus gain Google Daydream support this summer". The Verge. Vox Media. Retrieved 18 May 2017. ^ Matney, Lucas (17 May 2017). "Daydream VR support is coming to Samsung's Galaxy S8 and S8 Plus this summer". TechCrunch. AOL. Retrieved 18 May 2017. ^ Schoon, Ben (25 July 2017). "Daydream VR lands on the Verizon Samsung Galaxy S8/S8+ in latest update". 9to5Google. Retrieved 25 July 2017. ^ Reigh, Brian (25 July 2017). "Verizon Galaxy S8 and Galaxy S8 Plus getting Daydream support". Android Authority. Retrieved 25 July 2017. ^ Statt, Nick (18 October 2017). "Samsung partners with Google to bring ARCore platform to Galaxy devices". The Verge. Vox Media. Retrieved 5 December 2017. ^ Li, Abner (18 October 2017). "Samsung adopts Google's ARCore platform, coming to Galaxy Note 8, S8+, future devices". 9to5Google. Retrieved 5 December 2017. ^ Abhijeet. "BREAKING: Galaxy S8 Android 8.0 Oreo update now rolling out". SamMobile. Retrieved 8 February 2018. ^ Seifert, Dan (18 April 2017). "Samsung Galaxy S8 review: Ahead of the curve". The Verge. Vox Media. Retrieved 21 April 2017. ^ Savov, Vlad (1 April 2017). "The Galaxy S8's misplaced fingerprint scanner was probably a last-minute change". The Verge. Vox Media. Retrieved 21 April 2017. ^ Velazco, Chris (18 April 2017). "Samsung Galaxy S8 and S8 Plus review: Redemption is here". Engadget. AOL. Retrieved 21 April 2017. ^ Russell, Brandon (15 May 2017). "The Galaxy S8's camera couldn't beat the Google Pixel". TechnoBuffalo. Retrieved 17 May 2017. ^ Amadeo, Ron (21 April 2017). "Galaxy S8 review: Gorgeous new hardware, same Samsung gimmicks". Ars Technica. Condé Nast. Retrieved 21 April 2017. ^ F., Adnan (7 February 2017). "Galaxy S8′s Bixby AI assistant will have support for 7-8 languages". SamMobile. Retrieved 27 April 2017. ^ F., Adnan (30 March 2017). "Bixby won't have support for British English at launch". SamMobile. Retrieved 27 April 2017. ^ Hall, Chris (29 March 2017). "Bixby, Samsung's smart AI, launches on the Galaxy S8 but only supports US English and Korean". Pocket-lint. Retrieved 27 April 2017. ^ Machkovech, Sam (12 April 2017). "Samsung's new voice assistant won't understand English when Galaxy S8 launches". Ars Technica. Condé Nast. Retrieved 27 April 2017. ^ Welch, Chris (19 July 2017). "Bixby voice support is rolling out to US Samsung Galaxy S8 users today". The Verge. Vox Media. Retrieved 20 July 2017. ^ Russell, Jon (18 July 2017). "Samsung's Bixby assistant finally comes to the Galaxy S8 and S8+ in the US". TechCrunch. AOL. Retrieved 20 July 2017. ^ "Galaxy S8 pre-orders in South Korea hit 720,000 units in a week". GSMArena. 13 April 2017. Retrieved 21 April 2017. ^ Rutnik, Mitja. "Update: Galaxy S8 pre-orders now at 728,000, higher than Galaxy S7". Android Authority. Retrieved 21 April 2017. ^ Pham, Sherisse (19 April 2017). "Samsung's Galaxy S8 is super hot in South Korea". CNN Tech. CNN. Retrieved 23 April 2017. ^ Rutnik, Mitja. "Record-breaking Galaxy S8 pre-orders top 1 million in South Korea". Android Authority. Retrieved 23 April 2017. ^ Welch, Chris (24 April 2017). "Samsung says Galaxy S8 preorders were its best ever and promises software fixes". The Verge. Vox Media. Retrieved 24 April 2017. ^ Ingraham, Nathan (24 April 2017). "Samsung's Galaxy S8 hits sales records despite the Note 7's flameout". Engadget. AOL. Retrieved 24 April 2017. ^ Lee, Alex (16 May 2017). "Samsung Galaxy S8 global sales top 5m". The Investor. Retrieved 18 May 2017. ^ Mu-Hyun, Cho (16 May 2017). "Samsung sells 5 million Galaxy S8, S8 Plus units". ZDNet. CBS Interactive. Retrieved 18 May 2017. ^ Fingas, Jon (16 May 2017). "Samsung sold over 5 million Galaxy S8 phones". Engadget. AOL. Retrieved 18 May 2017. ^ a b Amadeo, Ron (24 April 2017). "Samsung Galaxy S8 to get software patch for "red tint" issue". Ars Technica. Condé Nast. Retrieved 9 May 2017. ^ Mu-Hyun, Cho (18 April 2017). "Samsung confirms Galaxy S8 red display issue". ZDNet. CBS Interactive. Retrieved 22 April 2017. ^ Moon, Mariella (19 April 2017). "Early Galaxy S8 owners complain of red-tinted screens". Engadget. AOL. Retrieved 22 April 2017. ^ Ji-hye, Shin (21 April 2017). "Samsung to update Galaxy S8 software for red screen". The Korea Herald. Retrieved 22 April 2017. ^ Young-won, Kim (21 April 2017). "Samsung plans software update for Galaxy S8 to address reddish screens". The Investor. Retrieved 22 April 2017. ^ Jonnalagadda, Harish (1 May 2017). "Galaxy S8 and S8+ update to fix red tint issue is now rolling out in India and Europe". Android Central. Mobile Nations. Retrieved 9 May 2017. ^ Bader, Daniel (8 May 2017). "Telus and Bell rolling out Galaxy S8 and S8+ 'red tint' fix". Android Central. Mobile Nations. Retrieved 9 May 2017. ^ Mills, Chris (2 May 2017). "The fix for the Galaxy S8's screen problem has finally reached the US". BGR. Penske Media Corporation. Retrieved 9 May 2017. ^ Gordon, Scott Adam. "Some Galaxy S8s are restarting by themselves". Android Authority. Retrieved 29 April 2017. ^ Cipriani, Jason (28 April 2017). "Samsung Galaxy S8 users complain of random restarts". ZDNet. CBS Interactive. Retrieved 29 April 2017. ^ Carman, Ashley (31 March 2017). "The Galaxy S8's facial scanner can, unsurprisingly, be tricked with a photo". The Verge. Vox Media. Retrieved 5 April 2017. ^ Amadeo, Ron (31 March 2017). "Galaxy S8 face recognition already defeated with a simple picture". Ars Technica. Condé Nast. Retrieved 5 April 2017. ^ Chowdhry, Amit (31 March 2017). "Samsung Acknowledges Galaxy S8 Facial Recognition Security Limitations". Forbes. Retrieved 5 April 2017. ^ Ip, Chris (23 May 2017). "The Galaxy S8 iris scanner can be hacked with aging tech". Engadget. AOL. Retrieved 24 May 2017. ^ "Samsung S8 'eye security' fooled by photo". BBC News. BBC. 23 May 2017. Retrieved 24 May 2017. ^ Gibbs, Samuel (9 October 2017). "Galaxy S8: Samsung users complain of SMS messages that fail to arrive". The Guardian. Guardian Media Group. Retrieved 5 December 2017.